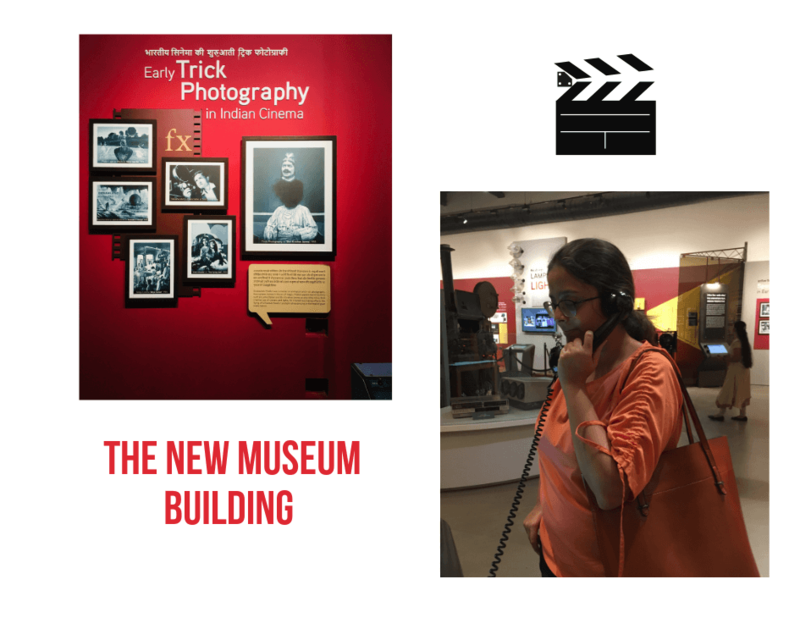 There’s a new museum in town and I was amongst the privileged few who got to visit the National Museum of Indian Cinema at Peddar road before it was open to the public. 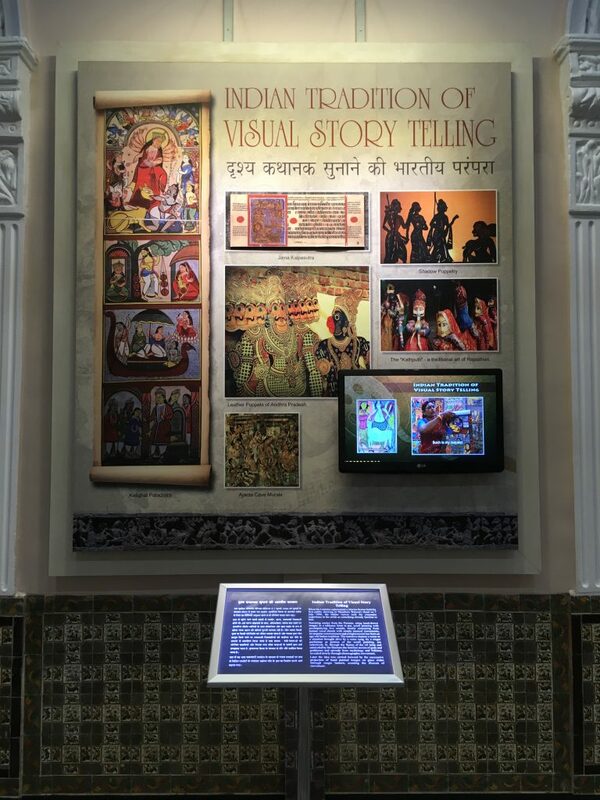 If I have to sum up the visit in a single sentence I would say, “The museum transports you back in time to a magical world where cinema was transforming India through visual storytelling”. 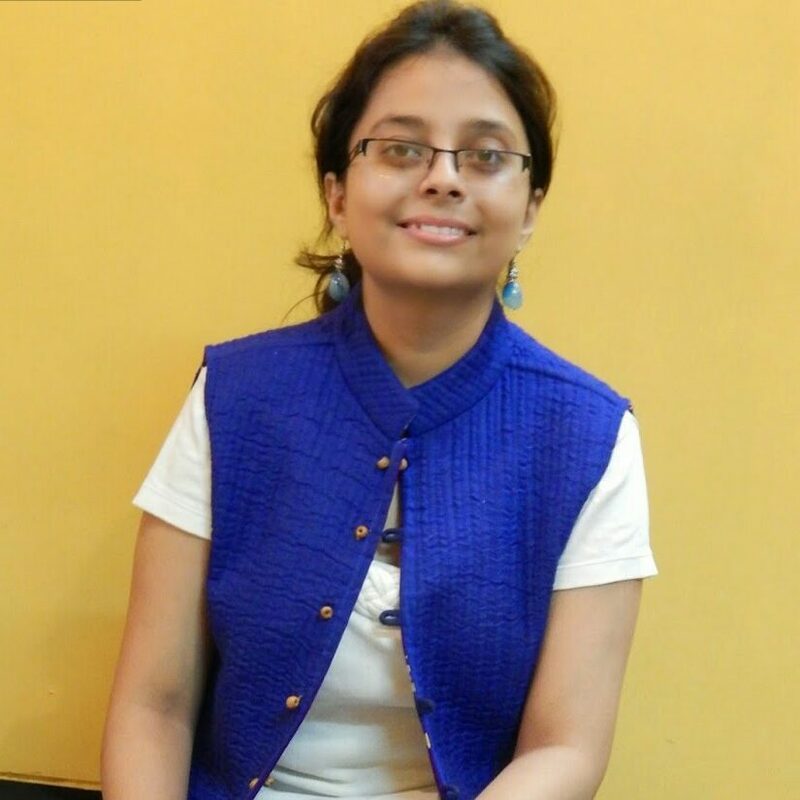 India has a strong tradition of storytelling present in every community. Legends and mythological tales have been passed on through oral and written stories. The birth of motion-pictures or cinema in the late 19th-century revolutionized the art of storytelling. We fell in love with the style of drama, script, music, and dance. Today, India stands first in terms of annual film output with as many as 1600 cinemas being produces in multiple languages. Beginning in the early 20th century, Indian Cinema has reached great heights over the years. Hindi cinema, popularly known as Bollywood is the largest with Tamil and Telugu cinema not far behind. 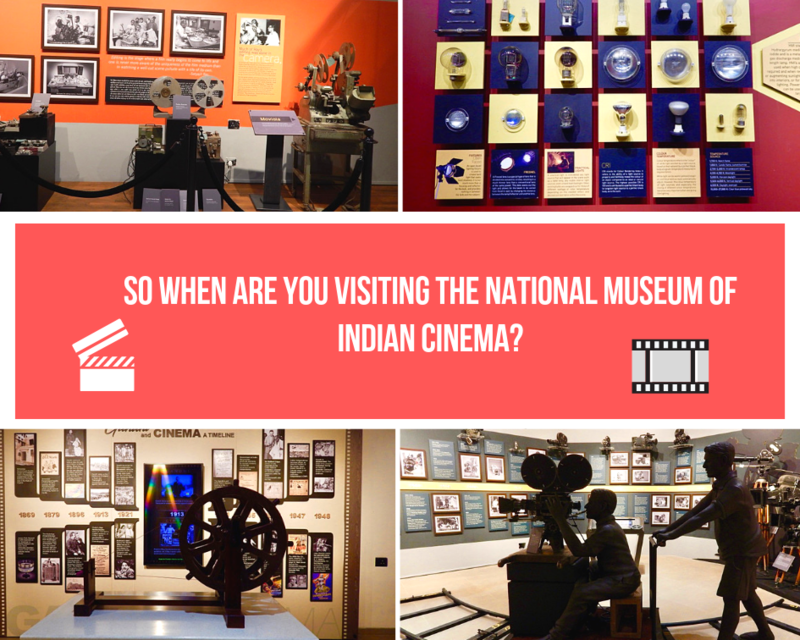 Cinema in other local languages like Malayalam, Marathi, Bengali and others too have contributed to its richness. 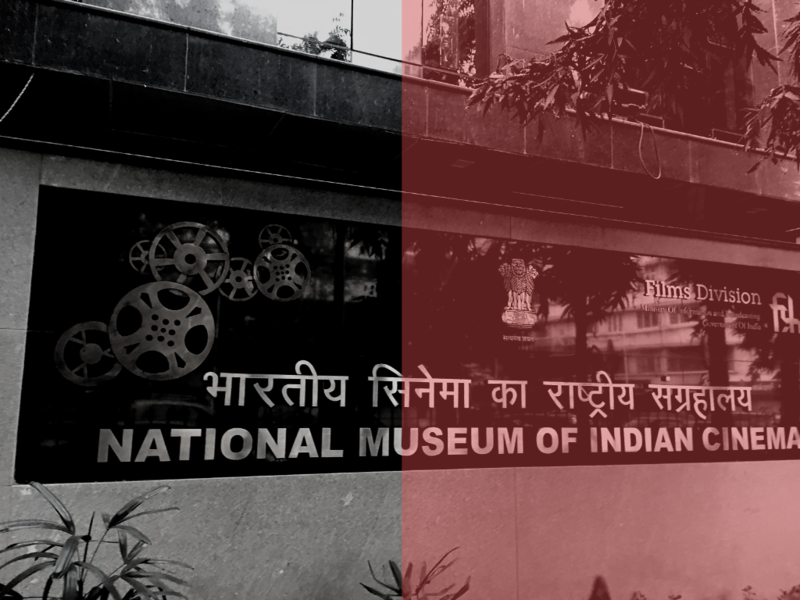 The National Museum of Indian Cinema which opened in Mumbai earlier this January is an attempt to showcase the rich heritage. 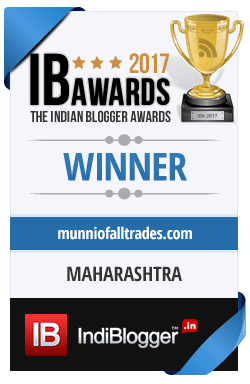 The National Museum of Indian Cinema at Mumbai is housed in two buildings; the Gulshan Mahal and the New Museum building. We visited the New Museum building first. There are 4 levels in the museum and each level has a specific theme. Let’s explore the 4 levels together. 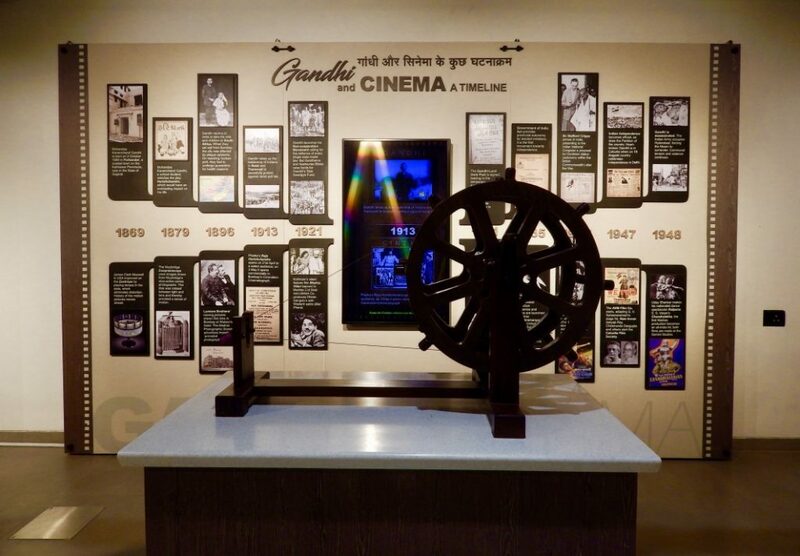 Level 1 has interestingly been dedicated to Mahatma Gandhi and the influence he had on Indian cinema which until the 1930s had exclusively limited itself to depicting and glorifying mythology. His ideas and philosophy had a great impact on encouraging cinema around the freedom struggle during the 1940s. It further influenced neorealism in Indian cinema that was to develop in the 1950s. 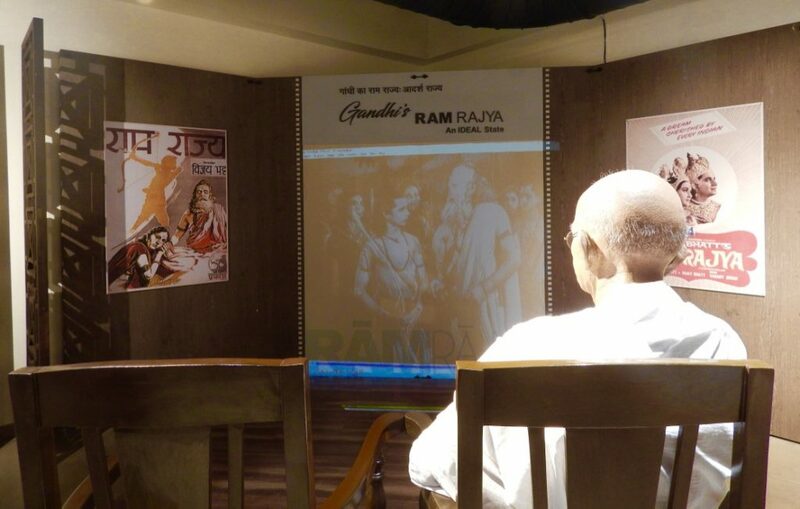 There is a statue of the Mahatma sitting and watching Ram Rajya, directed by Vijay Bhatt in 1943. It is claimed that this was the only film he had seen, in parts. The hall also makes mention of an interesting visit of the Mahatma with Charlie Chaplin while in London in 1931. Many believe that that this meet inspired his thinking when he went on to produce films like Modern Times and The Great Dictator. How true is it? We may never know. Level 2 which is Children’s Film Studio is the interactive section of the museum. We can don a director’s hat or learn the basics of production. There are so many options to choose from! In this level, you can get acquainted with the technology and science involved in the process of film making. Hands-on learning about lighting, sound, editing, animation, special effects, and other technical processes makes this a very interesting place. Can you spot me in the photo below? They have a number of interesting photo-ops and props that children and adults can play with. From working on the technical aspects of cinema, one begins to understand that cinema is a creative technological production of the human imagination. 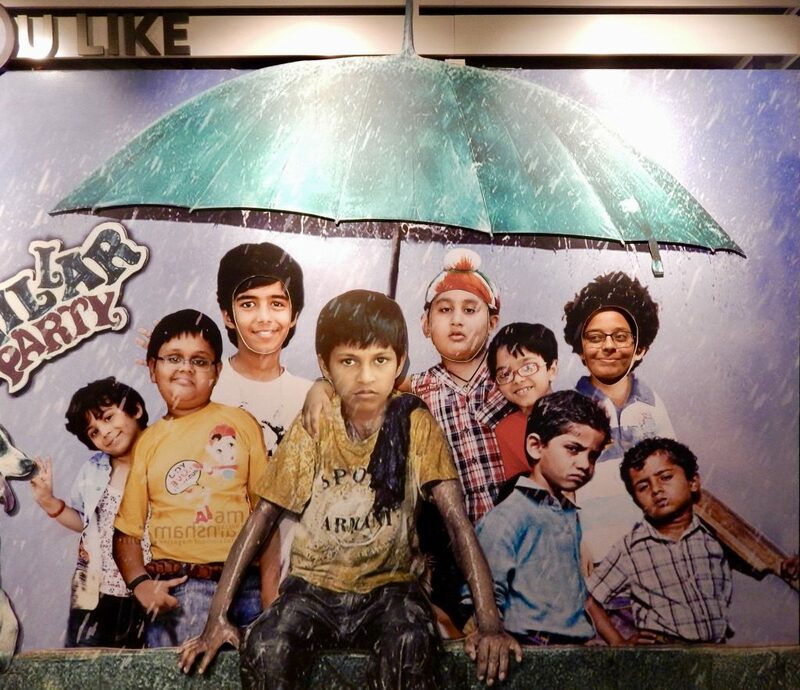 Level 3 showcases how technology and creativity both played an important role in Indian cinema. It traces the history of Indian cinema. Beginning with the Lumiere brothers showcasing their invention of motion pictures in 1896, we are taken back to the time when Dadasaheb Phalke was inspired to produce Raja Harishchandra. This was India’s first feature-length silent film and premiered in 1913 in Mumbai. The history of lighting, choreography, editing and the various ways in which Indian filmmakers used technology to produce cinema is introduced. The tilted camera shots used by Shantaram and the bounce light effect mastered by Subrata Mitra are highlighted. The transition of cinema from the silent era to the sound era with Ardeshir Irani’s film Alam Ara in 1931. The last and final level is dedicated to the diversity of Indian cinema and how it has grown over the last 100 years. The digital age has made cinema more accessible to the population across the country. The Gulshan Mahal is a 19th-century bungalow which was first owned by Peerbhoy Khalakdina. It is now an ASI Grade 11 Heritage structure. We visited The Gulshan Mahal after going to the new museum building. However, we recommend you begin your tour here. 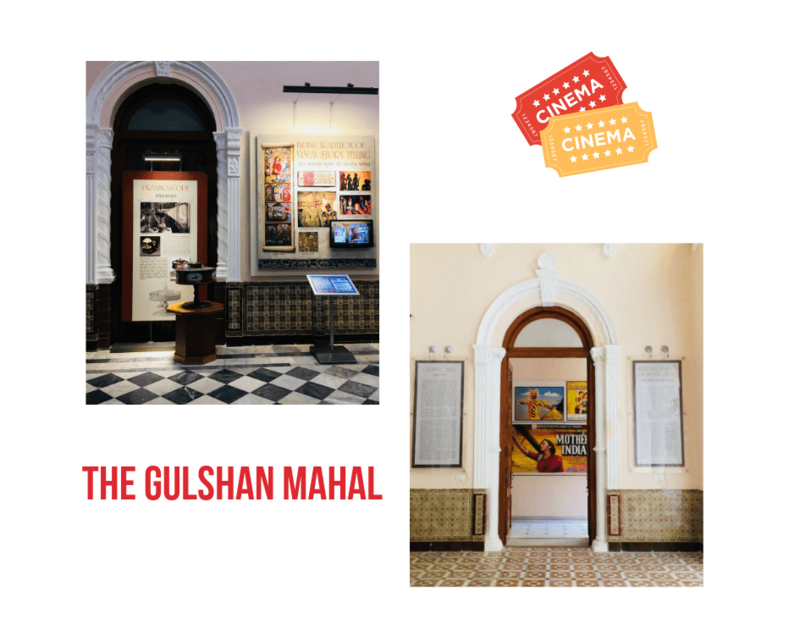 The Gulshan Mahal houses popular posters, artifacts, film clips and multimedia kiosks. It also has a 30-seater mini theatre. Cinema is a creative technological production of the human imagination. The early 20th century had seen nascent developments in technology related to film-making. This was a time when directors and the whole movie making team brought a lot of innovation to bring about special effects. Budget constraints further demanded great creativity from actors, choreography and editor. 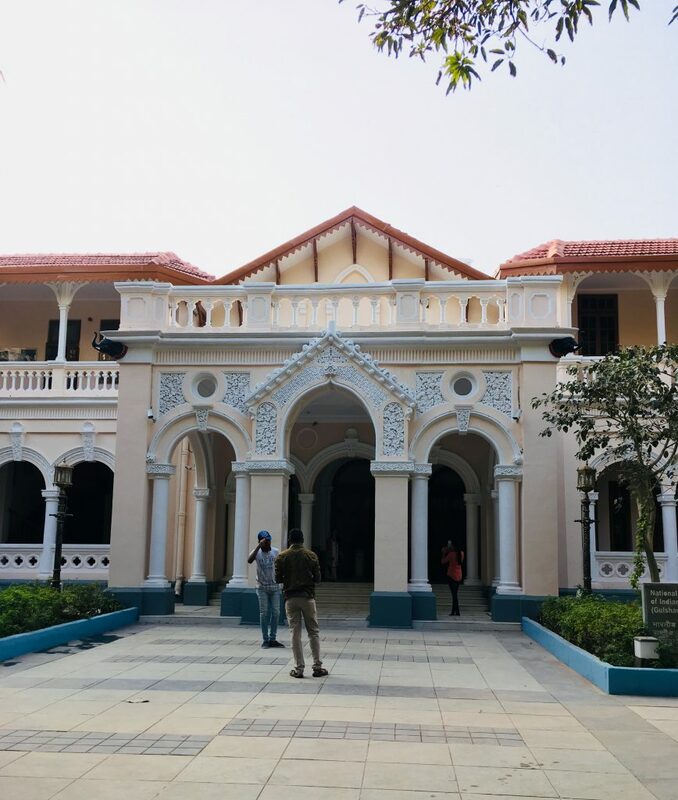 The National Museum of Indian Cinema is partly housed in the 19th-century heritage building of Gulshan Mahal with the interactive galleries located in the New Museum Building at the Film Division complex. It is open from Tuesday to Sunday between 11 a.m and 6 p.m.
Indian nationals have to pay a nominal entry fee of Rs. 20. Students with valid ID cards and children get a free entry. Do not miss the film screening that runs every day from 4 p.m to 5 p.m in the ground floor of the museum.